In this three-hour workshop, you’ll learn how to use your own comedic perspective to craft satire for the web. We’ll discuss the basics of comedy and satire writing, how to find ideas, brainstorming headlines, and how to write and format your own articles. Students will leave with an understanding of how satire works as well as have a few headlines of their own. The class will include discussions, writing exercises, and how you can use improv to help your writing. 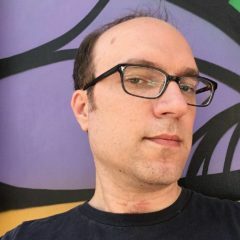 Jeff Cardello has been a staff writer for the satirical magazine the Hard Times for over three years, as well as being an improviser, podcaster, and all-around comedy nerd. Outside of putting together words that are funny for the Hard Times, he also works full time as a freelance copywriter, writing blogs, video scripts, and radio spots for a variety of clients.